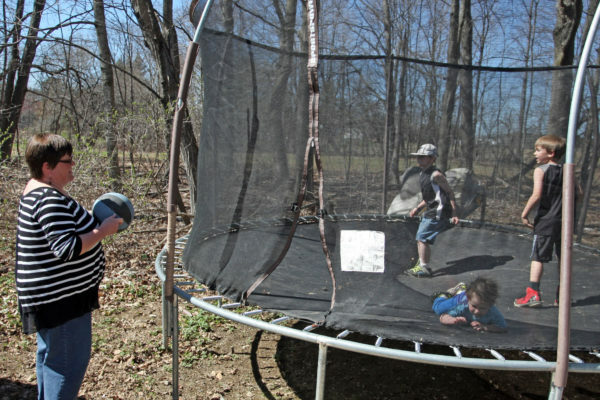 Sharon Bulley of Houlton keeps an eye on her three adopted children Charlie, Jacob and Isaiah as they jump on a trampoline Friday afternoon. The three boys were once under foster care with Sharon and her husband John before the Bulleys adopted the boys. More than 110,000 children in the U.S. foster care system are legally free for adoption, yet more than 20,000 of these kids will never find an adoptive family. After a childhood of hardship, youth exiting the system without family support face a high risk of unemployment, homelessness, incarceration and other negative life outcomes. But the 2017 U.S. Adoption Attitudes Survey offers a glimmer of new hope. According to the survey, nearly 80 percent of individuals looking to adopt for the first time would consider adopting a child in foster care, a 7 percent increase since 2012. Rita Soronen, the chief executive of the Dave Thomas Foundation for Adoption, the organization that commissioned the study, considers this a substantial shift in public attitudes. Choosing to adopt through the foster care system means accepting that the process and sometimes the outcome can be uncertain. Bureaucratic procedures vary from state to state and even county to county, but the practice of concurrent planning, which places children with potential adoptive families before the termination of parental rights, is standard. This approach, designed to reduce the amount of time children spend in the system, investigates options for permanent reunification with the birth family while foster parents care for the child and stand ready to adopt that child if parental rights are severed. But even for prospective parents who come with eyes wide open, the experience can be emotionally fraught. For author Jillian Lauren and her husband, Scott Shriner, bassist for the band Weezer, the adoption of a 3-year-old boy named Jovi from Los Angeles County proved a bit smoother. Jovi had already spent a year and a half in foster care by the time the couple met him, with bureaucratic decision-making regarding his future well underway. The couple also has a son, Tariku, adopted from Ethiopia, an experience that Lauren chronicled in her memoir, “Everything You Ever Wanted,” but the tremendous need for foster-adoptive families shaped their choice for their second adoption. Soronen explains that when society takes the dramatic step of legally terminating parental rights, there’s an implicit promise of a new family made to that child, a promise that too often is broken. Plenty of prospective parents are open to infants and toddlers, but the average child in foster care is 8 or 9 years old. Sibling groups and kids with special needs may also languish. As North America’s largest charity devoted to finding homes for children in foster care, the Dave Thomas Foundation has chosen to focus its efforts on these children who might have previously been considered unadoptable. The Wendy’s Wonderful Kids program, named after the restaurant chain founded by Thomas, who was himself an adoptee, seeks families for foster children who are legally free for adoption. The program, which was founded in 2004, has served 16,000 foster children so far. Its caseworkers, known as adoption recruiters, spend time getting to know each child. If a child is reluctant to change schools or doesn’t want to change their name after adoption, those concerns are noted and respected. Recruiters also identify important people in the child’s life, such as former teachers or extended family members, who may be able to help in the search for a new home. There have been 6,494 adoptions finalized with 4,300 kids currently looking for permanent homes. Naturally, the foundation wants to see that number increase. Child welfare experts and adoptive parents agree that any child adopted from foster care will have challenges to overcome, no matter the child’s age at placement. Krista Woods, a therapist who has counseled adoptive and birth families for 25 years in the Chicago area, and who was adopted as an infant from foster care, points to a realistic parental attitude as the key. Although parents may feel relief the day the adoption decree is signed, it’s only one milestone in the family’s longer journey. “Meeting children where they are, while supporting and encouraging them to reach for more, is a lifelong process,” Woods says. Sharon Van Epps is a writer and mother of three. She tweets @sharonvanepps.